Ez Stick Balls with Soft Sewn (W10015)-Sports Production-台州山水工艺有限公司官网,山水工艺,台州山水工艺,仙居山水,台州山水,Taizhou Mountain & River Art and Crafts Co.Ltd,Registered and established in 2006, Taizhou Mountain and River Crafts Co., Ltd is a storage trading company, also is the only one Sino-U.S. joint venture in Xianju County, which was jointly set up by the U.S.-based S&S Worldwide and Xianju Yikai Crafts Co., Ltd.
Set includes 20 yellow balls and 4 red/yellow two-tone balls. Soft, sewn 2-1/2" fabric balls filled with pillow-like polyfil material weigh about 3/4 ounces each and stick to any hook-and-loop surface. 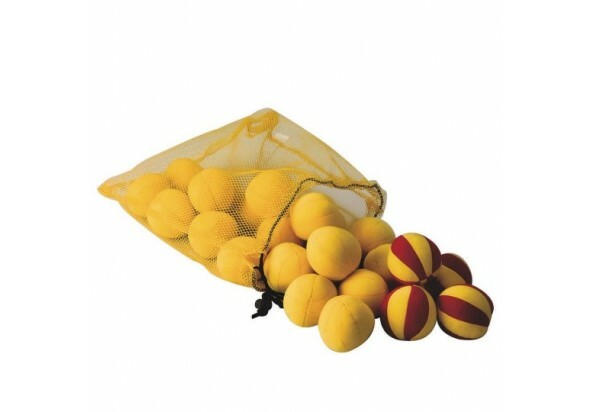 Perfect for use with our Destroy the Flag and Dodgeball Tag games and any other game where you used similar tennis ball-style sticky balls.